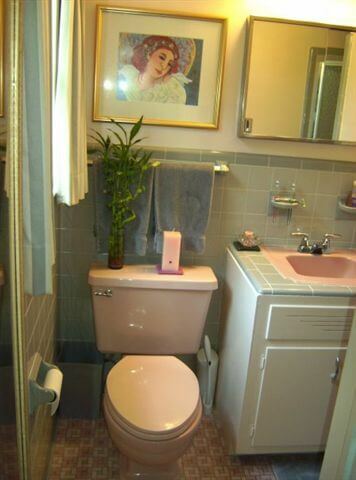 Susan peeks at us from the other side of her vintage, pink Jack ‘n Jill bathroom. I am so jealous. 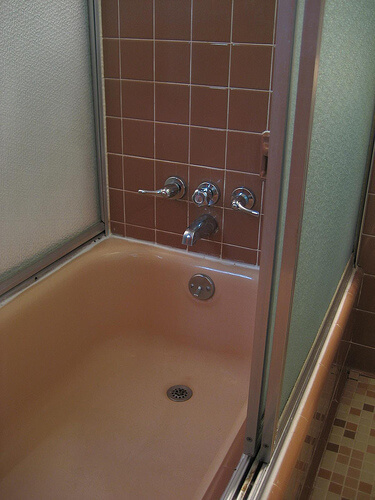 When we first bought the house I was not a fan of the bathrooms. 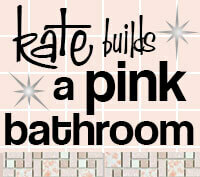 However, thanks to your site I have realized how great a pink bathroom can be! Though Eric (my fiancé) and I both grew up in the area we never knew of Northcrest’s existence. A mid century enthusiast friend encouraged us to check it out. We fell in love with the neighborhood and began driving through several times a week. We were in no position to buy a home but that didn’t stop us from checking out every new home listing and every open house. We became total Northcrest stalkers and I’m sure the neighbors probably became concerned. While looking in the windows of a property for sale Eric was approached by a man who had been driving by. He said he had a house for rent around the corner and would Eric like to see it? Of course Eric agreed. The guy led him around the corner to his recently vacated rental and showed him around. He told Eric that no one seemed interested in renting so he would also be willing to sell it since he was living on the other side of town and paying two mortgages. Eric loved it and a few days later on our regular stalker drive Eric took me by to see the house. The owner just happened to be there (coincidence or fate?) cleaning a few things up and let me come in to look. 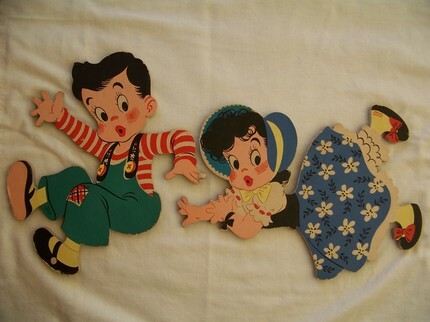 I was smitten too! Soon after our visit the owner called to ask if we would like a chance to buy the home before he hired a realtor and put it on the market. Being in no position yet to buy we declined and in February the house went up for sale. In May the house went under contract. We were heartbroken and even stopped driving through the neighborhood for a while. It was just too depressing. Later that month we found a realtor and began our house hunt in earnest. We looked plenty of houses in plenty of neighborhoods. While many were lovely and we tried really hard to like them none had that “this is it!” feeling like our Northcrest home. Then one day I got an excited call from Eric. He had just driven through Northcrest and had great news. Our house was no longer under contract and it was still for sale! It was like it had been waiting for us. We immediately called our realtors (who told us the house had actually been under contract twice), put in an offer and after much negotiating, which is a whole other story, the house was ours! We closed on July 21st. It hasn’t been totally smooth sailing. Part of our negotiations with the seller was trying to figure out what to do about the plumbing. 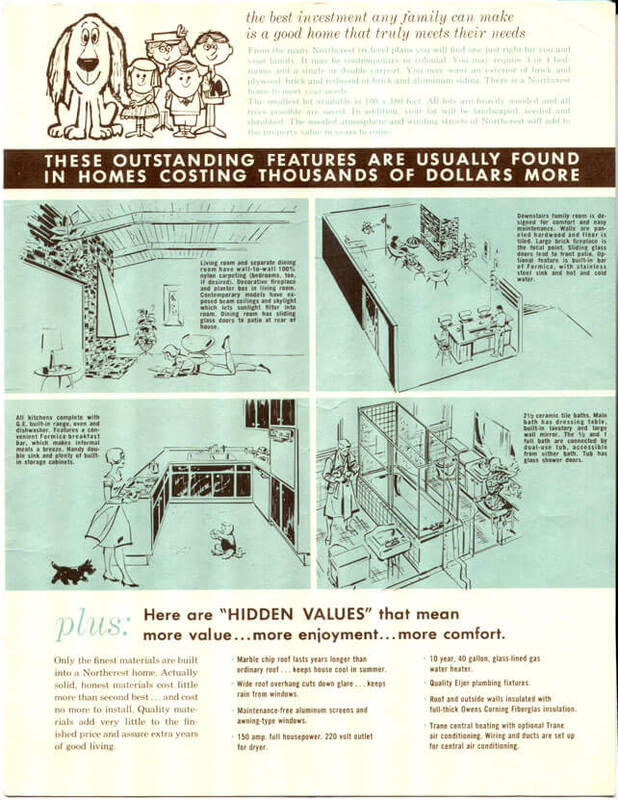 When our home was built copper piping was cheap and galvanized steel was the fancier way to go. Unfortunately steel pipes rust. We had to have all the plumbing in the house replaced all the way out to the street. It took 3 days of no water but we got it done! The dishwasher is old and at one point was draining into the crawl space. The oven thermostat doesn’t work right. The carpet was totally disgusting and the basement floor is covered in asbestos tiles. The exterior of the house is actually 3 different colors of grey because no one bothered to match the paint for touch ups. The best paint is on the front so it looked good for realtor pictures. However, all those not so great things are what made the house affordable! We have beautiful tongue and groove pine ceilings, an awesome brick fireplace and wet bar in the den and totally great neighbors! The living room has a wall of windows looking out onto our front yard. The path to the neighborhood pool goes right next to our house. Since the house was not upgraded in any way it leaves plenty of room for awesome renovations! We are in the process of stripping (yes taking all the necessary lead paint precautions) the old paint off the kitchen cabinets and making new cabinet doors. [Pam adds this note: Way to go with environmental and safety precautions. Gold star.] 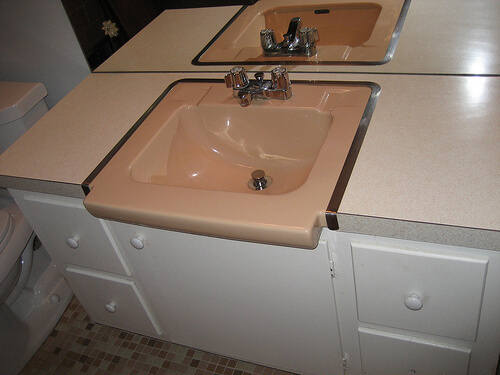 (We are thinking of getting some snap on stainless counter edging. 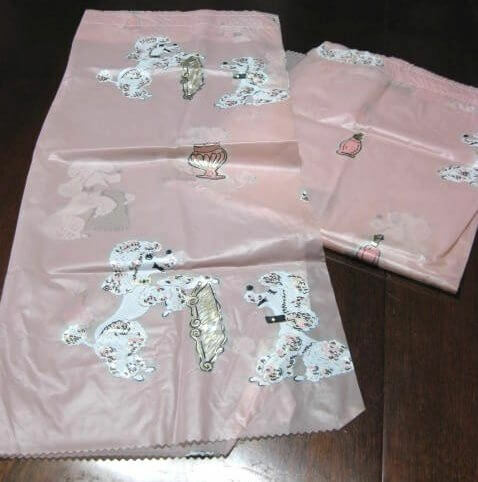 Take a look at the pictures and see what you think!) A new counter top is in order for the wet bar and we are considering taking down drywall a previous owner put up over an exposed brick wall. The downstairs bathroom is going to get new drywall and a new floor. 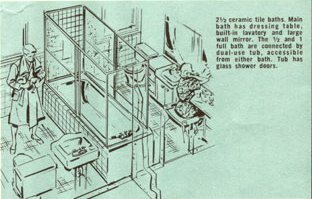 The Jack and Jill was to be the bathroom of the future! Many of the homes in our neighborhood have them (or had them. People tend to redo them). 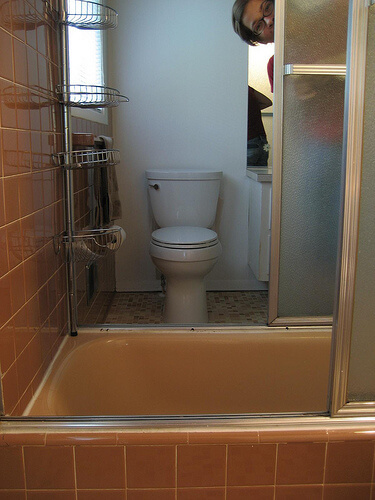 The bigger, more narrow side of the bathroom is the guest bath which is accessible from the hallway. The smaller one is attached to the master bedroom. We are pretty sure the star burst light fixtures are original. 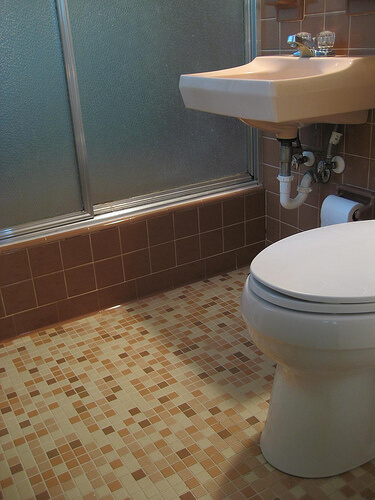 The tile is in sad shape but we think a good professional cleaning and sealing will make it almost new again. The ceilings are stained tongue and groove pine. I also threw in the picture of the outside of the house. It’s all so exciting. I really couldn’t imagine being anywhere else! Susan and Eric’s blog: Our Modern Mess. P.S. I also added you to our 10 BEST BATHROOMS list. Woo hoo! Welcome to a wild, exciting, rewarding ride of retro renovating, Susan! Reading your story makes me long to start all over again. Your house is beautiful! I absolutely love this bathroom!! What a great room! 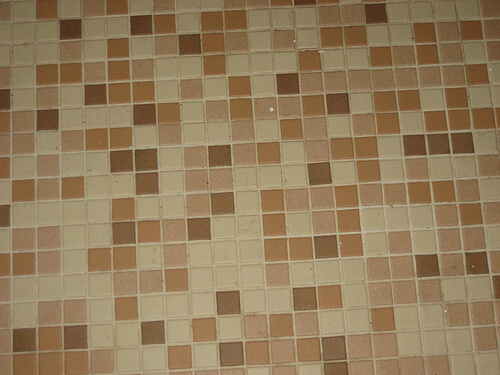 I am drooling over the floor, it’s beautiful! 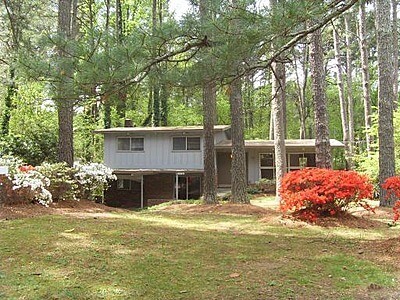 Love the woodsy setting of the house, with those pines and azaleas. 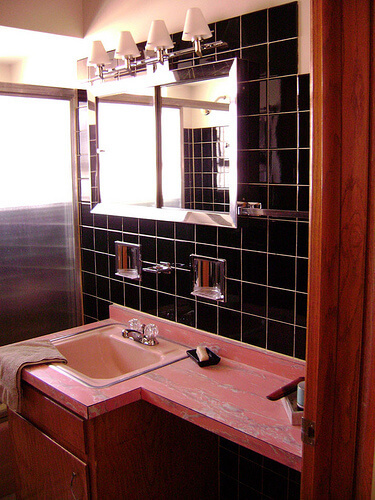 The bathroom is cool, particularly the big wooden sink cabinet. Have fun in your new retro home! I just LOVE to hear about people falling in love with the era and the houses and I’m so glad you’re not ripping out your bathroom and all the other wonderful things in your house. After renovating and doing so many building projects over the years it’s just lovely to hear the saga again from someone else’s point of view.I live north of San Francisco where most of the homes have been bought, sold ,renovated and flipped to death.People usually think you’re crazy to try to save anything and it’s rare to see the old fixtures.Just persevere like I know you have and you’ll have a true gem in the end.